Drivers on the A, C East and Super C Routes will now deviate ¾ of a mile off fixed routes for trip origins and destinations. Requests must be made at least 24 hours in advance with Transit Dispatch at 740-373-7671. Drivers on the Thursday New Matamoras/Macksburg and Friday Belpre City Routes will now deviate up to 3/4 of a mile off fixed routes to pick up and drop off passengers. Requests for deviations for next day service can be made by calling transit dispatch at 740-373-7671. Washington-Morgan Community Action operates the public transit system in Washington County on behalf of the Washington County Commissioners and the City of Marietta. CABL buses are fast, reliable and give a stress-free way to get to where you want to go. CABL strives to provide the highest quality of delivery services to all users of the public transit system. CABL is available to the general public and can accommodate persons who use wheelchairs, walkers, crutches, canes, guide dogs or other mobility aids. All CABL buses are lift equipped and display the wheelchair accessibility symbol on the rear of the bus for easy identification. CABL provides curb-to-curb paratransit services to eligible disabled persons during the same hours of operation as the City A Route, Monday through Friday. 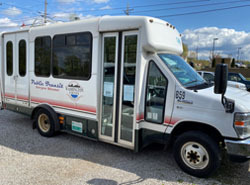 Disabled riders may apply for a Paratransit Card by contacting the Housing & Transportation office at 740-373-7671 or downloading and returning this application to: Community Action Bus Lines, 698 Wayne Street, Marietta, Ohio 45750. Paratransit Application. CABL buses travel across select areas of Washington County, from doctor’s offices, to shopping areas to government services building to get riders where they need to go. Fares are 80 cents one-way in the City of Marietta. Fares across Washington County range from 1 to 3 dollars, depending on distance. Half fares (40 cents) are available to riders 65 years of age or older, disabled persons, and/or Medicare card holders by presenting a valid identification when boarding a CABL bus. Riders may also request a “Go Card” by contacting the Housing and Transportation office. For more information on CABL, call: (740) 373-7671, Ohio Relay Service TDD 1-800-750-0750.